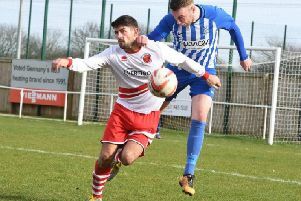 Nine-man Skegness Town climbed one place in the league table after a dramatic match at Rossington Main. The seasiders conceded a late penalty, robbing them of their first away win of the season on Saturday, but the solitary point lifted them to 17th in the table. The Lilywhites appeared to have done enough to bag their first away three pointer, but a harsh decision against Loz Lambley meant they had to settle for a draw. Indeed the defender felt doubly hard done by when the referee not only awarded the penalty kick, but sent him off after adjudging him to have deliberately handled. The Skegness camp believed the ball he closed down in the 89th minute struck him on his body, but the man in the middle believed otherwise and hopes of a win were extinguished when Lee Holmes stroked home the equaliser from the spot. It was a cruel blow for the visitors, who had battled against the odds to put themselves in with a shout of their first away win. Having lost defender Bailey Forth for a second yellow card midway through the second half, they were up against it, but Nicky Frost’s 52nd minute strike looked like securing them the match - until the spot kick was awarded. The impact of the double sending off is yet to be determined and the seasiders may even appeal against Lambley’s dismissal but, added to the suspension of Jordan Smith, it is bound to increase the pressure on the Lilywhites’ already depleted squad. Manager Martyn Bunce reverted to a central defensive pairing of Lambley and Simon Ashton, while Forth moved across to left back. Courtney Warren dropped back to right back and Peter Evison was selected for the starting line-up ahead of Marshall Young. With Callum Robinson injured, Bunce picked Daniel Stevens to play alongside Will Britton in attack and the change paid dividends when the visitors took the lead after just seven minutes. Ashton won a challenge in the middle of the park and released Britton, who went on a mazy run before firing goalwards. The Rossington keeper did well to keep his shot out, but Stevens was quick to pounce on the rebound and Skegness were in front. Stevens had the ball in the net a second time but this time it was ruled out for offside. As the half time whistle approached Rossington levelled through Willie McGhie, but seven minutes after the break Frost restored their lead with his third goal of the season. Following Forth’s dismissal the seasiders came under more pressure, but they worked hard to keep the home side at bay - until the penalty was awarded. TOWN: J. Lambley, Warren, Forth, Evison, Ashton, L. Lambley, Hobbins, Ford, Britton, Stevens, Frost, H. Bunce, Young. On Saturday Skegness continue their search for their first away win of the season when they travel to East Yorkshire Carnegie.